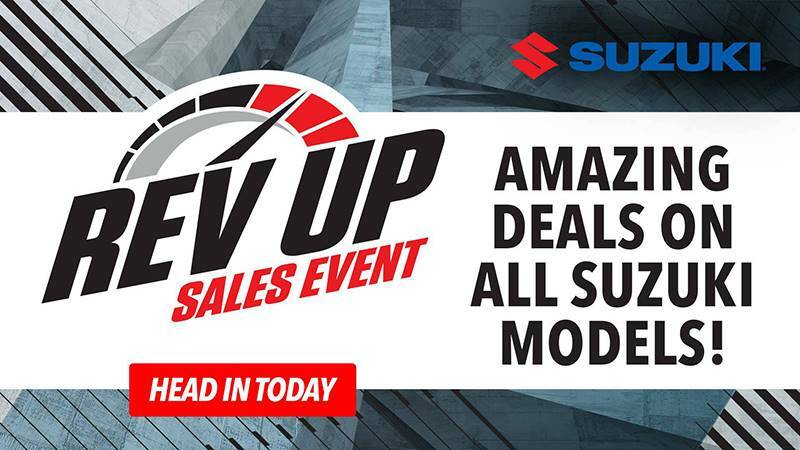 Suzuki - Rev Up Sales Event Promotion - Suzuki Motor of America Inc. | Available at Country Sports Inc.
Suzuki wants you to get a great deal on your next motorcycle or ATV. With special offers like Customer Cash and fixed low APR financing on select models, now's the perfect time to find the Suzuki of your dreams. Contact your local Suzuki dealer to learn more. All offers are subject to change without prior notice. Exclusions may apply. See your local dealer for specific model offers and details. 1 As low as 0% APR financing for 60 months on new and unregistered Qualifying Model is available through Sheffield Financial, a Division of Branch Banking and Trust Company. Member FDIC. Program minimum amount financed is $1,500; Maximum Amount Financed $50,000. Not all buyers will qualify. Approval, and any rates and terms provided, are based on credit worthiness. Other financing offers are available. $16.67 per $1,000 financed monthly payments required over a 60-month term at a 0% rate. Example: On a purchase where the Amount Financed is $7,500, your Down Payment is $0 with 60 monthly payments of $125.00 each. Interest Rate is 0% [ANNUAL PERCENTAGE RATE is 0%]. Financing promotions void where prohibited. See your local Suzuki dealer for details. Only valid in continental United States, excluding HI. Offer effective from a participating authorized Suzuki dealer between 2/1/19 and 4/30/19. Offer subject to change without notice. 2 Select new and unregistered models will receive a Customer Cash amount of $1,800, $1,500, $1,400, $1,300, $1,200, $1,000, $900, $950, $750, $700, $500, $350, $300, or $150 which is non-transferable and holds no cash value in the continental United States excluding HI. Visit www.suzukicycles.com/offers to see which select models qualify for customer cash. Excludes promotional financing. Offer effective from a participating authorized Suzuki dealer between 2/1/19 and 4/30/19. 3 As low as 4.99% APR financing for 60 months on new and unregistered Qualifying Model is available through Sheffield Financial, a Division of Branch Banking and Trust Company. Member FDIC. Program minimum amount financed is $1,500; Maximum Amount Financed $50,000. Not all buyers will qualify. Approval, and any rates and terms provided, are based on credit worthiness. Other financing offers are available. $18.87 per $1,000 financed monthly payments required over a 60-month term at a 4.99% rate. Example: On a purchase where the Amount Financed is $7,500, your Down Payment is $0 with 60 monthly payments of $141.51 each. Interest Rate is 4.99% [ANNUAL PERCENTAGE RATE is 4.99%]. Financing promotions void where prohibited. See your local Suzuki dealer for details. Only valid in continental United States, excluding HI. Offer effective from a participating authorized Suzuki dealer between 2/1/19 and 4/30/19. Offer subject to change without notice. 4 As low as 7.99% APR financing for 60 months on new and unregistered Qualifying Model is available through Synchrony Bank. Program minimum amount financed is $1,500. Not all buyers will qualify. Approval, and any rates and terms provided, are based on credit worthiness. Other financing offers are available. $20.27 per $1,000 financed monthly payments required over a 60-month term at a 7.99% rate. Financing promotions void where prohibited. See your local Suzuki dealer for details. Only valid in continental United States, excluding HI. Offer effective from a participating authorized Suzuki dealer between 2/1/19 and 4/30/19. 5 A purchase of a new 2018/2017 GSX-R1000R model (MSRP: $17,199), 2018/2017 GSX-R1000 ABS model (MSRP: $15,099), or 2018/2017 GSX-R1000 model (MSRP: $14,699) in the continental United States (excluding HI) will include a Yoshimura Alpha Signature Series Carbon Fiber Slip-On muffler (ARV: $699.00). Offer may be combined with promotional financing or Option 2 Customer Cash. See your local Suzuki dealer for details. Offer effective from a participating authorized Suzuki dealer between 2/1/19 to 6/30/19. 6 Conditions apply. This offer is valid for $250 factory customer cash off a new, unregistered 2016-2018 Suzuki KingQuad ATV model. Discount is taken off of listed price and is contingent on model availability. Offer must be validated by participating authorized dealer at time of purchase. May be combined with other current retail incentives so long as all conditions are met. No substitutions. Available to current 2014 and newer Suzuki motorcycle, scooter and ATV registered owners. See dealer for eligibility. Not redeemable for cash. Offers void where prohibited. Only valid in continental United States, excluding HI. See your local Suzuki dealer for complete details. Offer valid through 5/31/19.